Beat This Caption Contest 233 Winner – Caption Contest Funny Clever Witty Enter Today! Pee-Pi-Poo-Pum, I Smell Bowels of an Englishman! Bob’s military I.D. 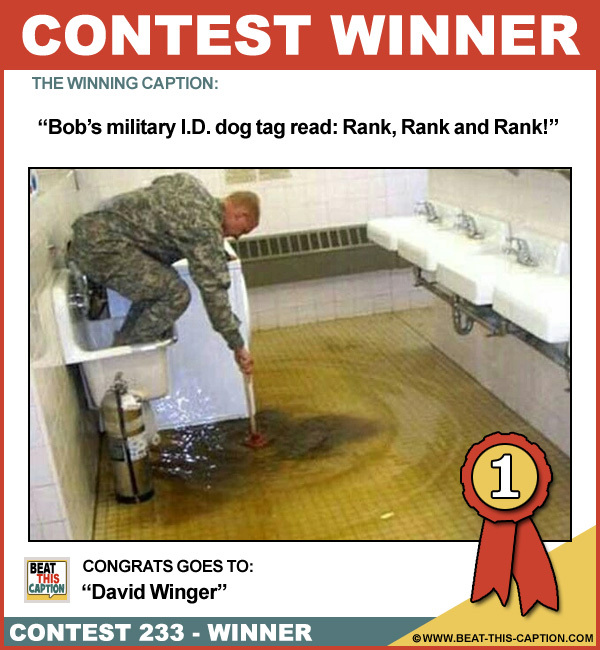 dog tag read: Rank, Rank and Rank! Bob picked the wrong place to attempt his one-handed plunger handstand! He stood in the sink instead of on a stool! Is the army, right for you?…Why not take the plunge! Homeland Security have raised the current threat status to brown alert!